With the increase in the availability of the internet, all the companies providing the services/products online including apparel, grocery, electronics etc,. To increase business sales and capture marketplace, Business owners are creating the online shopping website. But it is a bit expensive for small business owners to hire the web developers(web development company) for building an online shopping website. 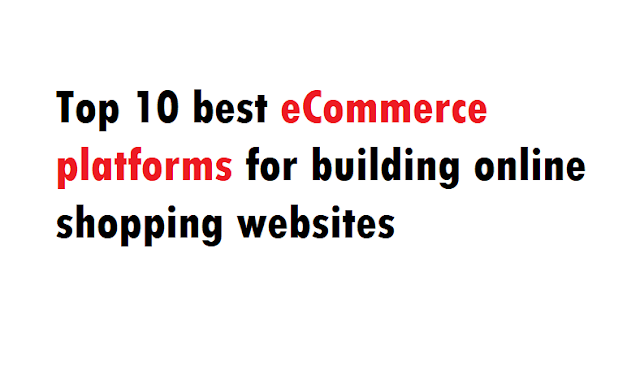 The best alternative for building an online shopping website is E-commerce platforms. E-commerce platforms make the web development process easier and faster. All the required common features (login, Registration, Cart page, checkout page etc,.) for building an online shopping website are predefined. There are many themes available which they can choose and install any of them with a just single click. Shopify is one of the best e-commerce platforms for building an online shopping website. You can build a website without writing a single line of code. Any Small Medium Business user can build a mobile and SEO friendly website for a less cost. The best thing about the Shopify is, you can start using Shopify for 14-days free and you can analyze the performance then you can pay for the service. Also, Shopify app is supported by all the major leading companies which make integrations easier. Shopify is secure and reliable to use. Magento is written in PHP and it is available in two distinct platforms: 1. Magento open source which is completely free and it is best suitable for the small business owners and developers can learn Magento platform by building the websites. The later one is Magento Enterprise edition which is paid version and it is best suitable for the big companies that have high traffic. BigCommerce is another best-hosted e-commerce platform to get started with building an online shopping a website. BigCommerce offers many free templates which you can make use of it. Similar to Shopify, the BigCommerce offers 15-day free trial for their customers to make a decision for choosing the best suitable plan. You can choose different payment options as a payment gateway such as Paypal, Square and Stripe etc,. WooCommerce is open source e-commerce plugin for WordPress. If you are using WordPress, then you can easily setup an online store by installing the e-commerce website. This is the best platform to build an online shopping website because it is SEO friendly and makes your business available in the search engines. It has very large community support and many developers are available in the market. Wordpress is a better choice if you plan to grow your site. OpenCart is a lightweight open source e-commerce platform. With help of OpenCart, you can develop an online store easily with less. There are hundreds of themes which makes your website process easier. OpenCart has user-friendly administrative and user dashboard. OpenCart is best suitable for small-medium business websites. If you have a large traffic then you can go with Magento or Shopify. PrestaShop is also one of the top and open source e-commerce platform. PrestaShop is best suitable for the enterprises with a low budget and willing to start an online store. PrestaShop is written and developed in PHP and it is as good as web 2.0. You don't need to be a developer in order to build an online store. You can learn and develop easily. Wix is a great platform for creating an online shopping online. Wix has site builder and page builder that helps to customize the website with ease. Learning Wix won't take much time at all and you can easily get familiar with the options that are available. Weebly is one of the best WYSIWYG(what you see is what you get) website builder in the market and it purely offers drag and drop option for customizing the website. Weebly is not best suitable for blogging. Squarespace is a software which allows building different kinds of websites easily with the help of site builder. With the help of Squarespace, you can build any kind of websites such as online stores, photographers, Blogs, restaurants, etc,. Drupal e-commerce is another best choice for building an online shopping website. It has many best features such as themes, plugins, user-friendly, SEO friendly and design. Based on your requirements and preference, you can choose your best e-commerce platform. Personally, I would prefer WordPress(WooCommerce) because of easy to use and can easily customize the website. The best thing is, even if you're running into issues, the large community support helps you to fix those issues. Topzenith brings the collection of top 10 things about all the categories such as Education, Health, LifeStyle etc, that is useful for the web surfers. We are a team of Five people started this blog to provide the web surfers to quickly access the information and get acquainted with the particular topic within less time. We know the information is very valuable and we strive hard to provide valuable content every week.